We are pleased to announce upcoming performance dates. Bring your family and friends to come see us soar in Madison, WI and Nashville, TN! Share the air - in our studio! 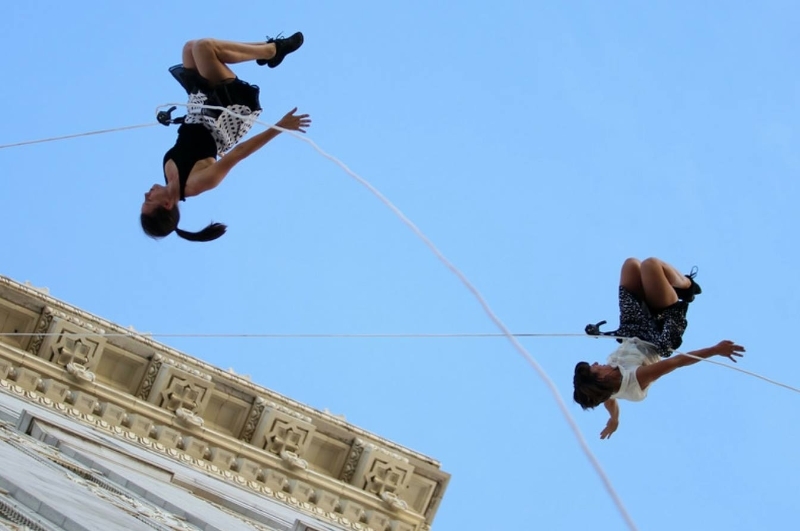 Nearly sold out: join BANDALOOP company members for an exciting 8-week Open Level workshop series! This unique opportunity focuses on our signature on- and off-the-ground technique, creative process, safety, and performance. All gear is supplied. The next Open Level workshop will be held October 11-12. Want to keep up with us while we are on the road? Follow us on Facebook,Twitter, and Instagram for fresh, jaw-dropping images as we dance in the sky! Use the hashtag #danceonwalls. Photo: BANDALOOP dancers at the Oakland ART + SOUL Festival.